I don’t expect anyone to actually follow it since there’s no real theme – i.e. I’m not exactly providing new content about anything specific. It’s more for me to just to collect random stuff that makes me momentarily happy. 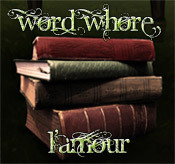 This entry was posted in blog and tagged fangirl, fetish, word-whore. Bookmark the permalink.